I'm a put-makeup-on-at-stupid-early-o'clock kinda gal, and I expect it to last me the day. 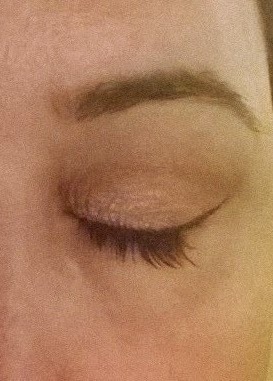 Powdering and lippie re-application, sure, these things are necessary enough, and if I've barely thrown on some quick eye makeup, that might fade, but I really don't expect a liquid liner or a mascara to die a death during the day. This is my main complaint with this stuff. It doesn't last. As you can see, this has a superfine nib/tip (it's a tapered brush, actually), far thinner even then my lovely Dior. So far so promising. The liner itself is a good formulation; fluid enough to flow without skipping or dragging. It dries relatively fast and dries-down into a finish somewhere between glossy and matte. Case-in-point: super-thin eyeliner flick from super-fine liquid eyeliner brush applicator. This took a couple of swipes to get it fully opaque, mind. This cost me £6.99. Presumably then, it'll cost you around the tenner (euro) mark down here. Look here for more info if you're interested. Personally, while there are things I like about it, it doesn't do what I want it to, which is to last the entire day. I imagine that I will use it the odd time, but I won't reach for it specifically over another option, and I won't repurchase.